Horns consist of a shell made of keratin and other proteins over a core of living bone. Removing horns allows cattle to be handled more safely and reduces injury to other cattle, which can also result in financial losses due to trimming of bruised carcasses. According to the latest National Beef Quality Audit, fewer than 11% of non-fed cattle and fewer than 13% of fed cattle processed in Canada in 2010-11 had any type of horns, and fewer than 3% had full horns, but the few horns that remain are costly. The economic loss to the industry caused by bruising is estimated at $2.10/head processed in addition to $0.06/head due to extra packing plant labor costs to remove horns from the carcass before skinning. Horn levies in Saskatchewan ($2) and British Columbia ($10), which are intended to encourage the dehorning of cattle in order to reduce injuries and economic impacts, add additional expense. 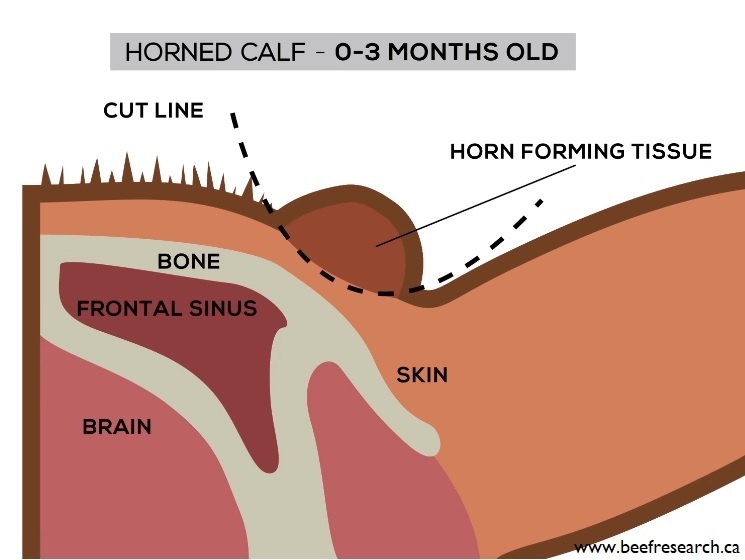 Calves should be dehorned at the youngest age possible, preferably while horn development is still at the horn bud stage (typically 2-3 months). Producers can talk to their veterinarians about ways to mitigate pain from dehorning. Selection for genetically hornless (polled) cattle is preferred. Polled genetics eliminate the costs, labor, animal health and welfare issues associated with dehorning. The natural “polled” gene mutation prevents horns from developing. A pair of Canadian studies published in 1996 and 1998 found miniscule difference in backfat depth between horned and polled bulls, but no difference in birth, weaning or yearling weight, pre- or post-weaning growth rate, scrotal circumference, carcass weight, marbling score, ribeye area or lean meat yield. The polled form of the gene is dominant to the horned form of the gene. All animals carry two copies of the gene. An animal with two copies of the polled version of the gene is called homozygous polled. All of its offspring will inherit a polled version of the gene, and they will all be polled even if they inherit a “horned” version from the other parent. An animal with two horned versions of the gene (homozygous) will have horns. An animal with one copy of the polled version and one horned version (a heterozygote, or carrier) will also be polled, because the dominant polled version masks the horned version. Eliminating horns from a population can take many years because the horned version of the gene can be invisibly carried by heterozygotes. If two carriers are mated, there is only a one-in-four chance that the offspring will be horned. Polled genetics are increasingly common in Canada, greatly decreasing the number of calves that need to be dehorned. Horns are not attached to the skull at birth. Removing the horn buds (disbudding) causes less injury and pain than removing attached horns. Disbudding destroys the horn-producing cells of the horn bud. Once the cells are permanently destroyed, horn tissue will not be able to grow later in life. Disbudding is effective in calves less than two to three months of age, before the horn has attached to the skull. Chemical disbudding involves applying caustic materials (usually hydroxide based) to the horn buds, which cause a chemical burning of the horn producing cells. Minor discomfort may occur, and care must be taken to ensure the chemical does not come in contact with skin or eyes. Hot iron disbudding physically burns the horn producing cells, with no risk of chemical burns to the skin, eyes or udder. Attachment of occurs between two to three months of age. Removing attached horns causes more pain, greater injury, longer recovery time and greater setback in animal growth. Spoon or tube dehorning uses a special tool designed to cut out the horn bud, along with any horn producing cells in young animals. Knives can also be used to cut around the skin and under the attached horn bud. Scoops or gouges are a sharpened hinged tube that slides over the horn and cuts out the horn along with the horn producing cells. In older cattle a portion of the skull may also be cut out. Dehorning larger animals is discouraged because the size of the wound, the degree of injury and pain, risk of infection and recovery time all increase with horn size and animal age. However, several methods can be used to dehorn large cattle if necessary. These include large gouges, keystone or guillotine dehorners, hand saws and obstetric (embryotomy) wire can be used. Tipping involves the cutting but not complete removal of the horn, typically done in older animals. This technique can also elicit pain, and bleeding, however the majority of the horn stays intact, and is typically viewed as less invasive and painful than other methods. Tipping reduces the risk of puncture injuries due to sharp horns, but does little do reduce the risk of bruising. Wounds usually heal well with no treatment, but dehorning can cause several post-operative complications. These include uncontrolled bleeding, fly contamination, and bacterial infection. Calves require observation for bleeding for 30-60 minutes after dehorning. Coagulants (blood stop powder), tourniquets, clamps or cauterizing with a hot iron can help to reduce blood loss. A fly repellent is recommended, and producers should watch for signs of infection for 10-14 days after dehorning. It is believed that pain, stress, recovery time and complications are minimized when dehorning is performed early in life. Several methods can be used to reduce the pain of dehorning. The adoption of these methods depends on economics, producer perception of pain and proper training. There is increasing interest in the use of anesthetic or analgesic drugs to reduce the pain associated with dehorning. An anesthetic (e.g lidocaine) is a drug that temporarily eliminates all feeling. Local anesthetics cause numbness; general anesthetic cause unconsciousness. Anesthetics need to be injected 5 to 20 minutes before the operation, and can provide several hours of pain relief. An analgesic temporarily eliminates pain, but not normal sensation. Injectible analgesics such as ketoprofen (Anafen), flunixin meglumine (Banamine) and meloxicam (Metacam) are longer-acting than anesthetics, and may provide some pain relief for up to one day after dehorning by reducing swelling and pain. Thanks to Dr. Cody Creelman, Veterinary Agri-Health Services, for contributing his time and expertise in writing this page.